iBubble, the gadget that wants to be your autonomous underwater camera. iBubble is a submarine drone, equipped with a camera which follows divers around, thanks to a connected wristwatch. Nowadays, many drones exist but none intended for underwater use. 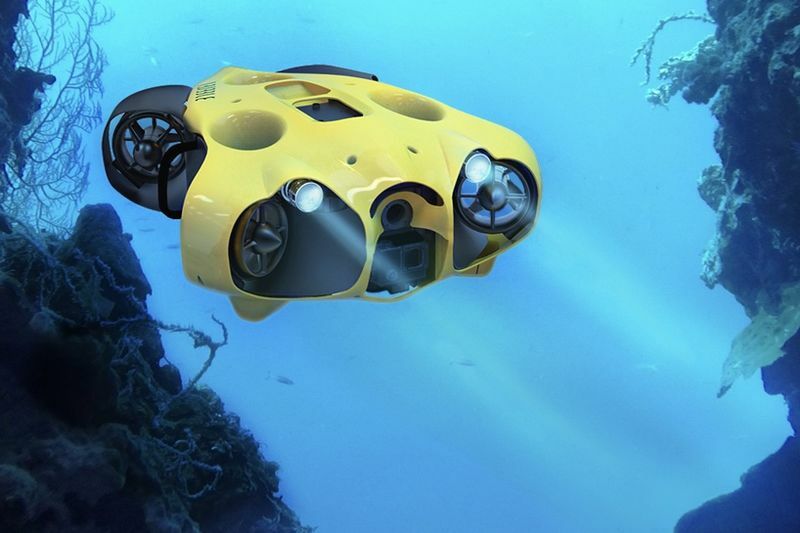 Think Think Design's latest project allows travelling underwater, shooting like never before and it can descend to 60 meters of depth with an autonomy of one hour. The drone is meant for diving enthusiasts who'd rather see the underwater world through his or her goggles without being burdened by an extra lens. The iBubble team notes that filming beneath the surface of the world's ocean can be a cumbersome process that "limits your freedom underwater". The iBubble's hydrodynamic design means that it will travel well underwater, withstanding currents of up to 3 knots. The French-based agency, Think Think Design, has supported Notilo+Company's submarine drone and, together, they have been awarded the design trophy at the Victoires de L’innovation in Lyon. In addition, the iBubble has been exhibited at this year's Dema Show in Florida. Have You Seen This Shapeshifting-flying Dragon Drone? Video: Introducing The Pocket Size, Wallet-friendly Drone Kit! Video: The Best 360 Camera Ensuring You Capture Everything!